9 E.g. Clementine Recognitions 1.46. 17 Testament of Adam 3.6; there is a similar story in Syriac Book of the Cave of Treasures. …When the temple was destroyed by the Babylonians, or maybe a short while before their invasion, the oil, the ark and the cherubim disappeared from the temple; but in the time of the Messiah and the true temple, it was said, they would return, along with the seven branched lampstand, the Spirit and the fire. The Spirit and the fire returned at Pentecost, and, if you read the Book of Revelation with temple-trained eyes, [opened eyes] you will find all the other missing items restored too. St John saw the true temple restored, and this is the earliest picture we have of Christian worship. This vision shaped even the simplest worship on earth, because the Christians were a part of it. …The outer part of the temple was called the holy place; the inner part was called the holy of holies, sometimes translated ‘the most holy place’. Now ‘most holy’ in temple-talk meant more than ‘very holy’. It meant actively holy, infectiously holy. Anything ‘most holy’ conferred holiness, but only the anointing oil – kept in the holy of holies – could confer ‘most holiness’ on a person or on a sacred object. The LORD told Moses how to blend the perfumed oil, and then he told him to anoint the furnishings and the high priests of the tabernacle ‘that they may be most holy, and whatever touches them will become holy’.22 Anyone entering the holy of holies became holy, a holy one, and that meant an angel. The holy of holies was the visible sign of the Source of holiness at the centre. …In the outer part of the temple was the golden table for bread, wine and incense.27 The table is mentioned in the tabernacle at Sinai28 and in Solomon’s temple,29 but nowhere in the Old Testament is there any detail about what the table and its offerings represented. Twelve huge loaves were set out with frankincense, and the Greek text says there was salt.30 The high priests [and by the time of Jesus, the other priests too] had to put fresh loaves into the temple each Sabbath, and then eat the ones they brought out. This was described as their ‘most holy’ food, which means it imparted holiness, and it was also an eternal covenant.31 The bread of the presence – ‘shewbread’ in some older Bibles – did not mean ‘set out in the presence’. It meant that the bread was, in some way, a presence. But whose presence did the high priests consume to nourish their holiness? The meaning of the temple furnishings and rituals was known only to the high priests, but some of them, such as Josephus, revealed enough to enable us to detect allusions elsewhere. …I have deliberately not mentioned the first day of creation, because there is no ‘first day’ of creation in the text of Genesis. Both the Hebrew and the Greek say ‘Day One’, not ‘the first day’. The origin of creation was not within time but was outside time. It was not a case of first, then second, then third and so on. The origin of creation was outside time, and the text marked this by saying Day One, instead of ‘first day’. On the sixth day of erecting the tabernacle, Moses purified the high priests to serve in the tabernacle, and on the sixth day in Genesis, Adam was created. The comparison shows that Adam was created to be the high priest of creation. He was created to be the presence of the LORD. When the high priest was anointed, the oil was put on his eyelids to open his eyes, but also on his forehead in the shape of a cross. This was the sign of the name of the LORD.38 The Christians also had this mark, given at baptism. In the Book of Revelation, St John tells how he saw a multitude whom the angel would mark on their foreheads, and then he saw them standing before the throne in heaven, which means they were in the holy of holies. They all had the name, that is, the cross, on their foreheads 39, and so they were all high priests. …Now let us see how this understanding of high-priesthood can illuminate the Genesis story of Adam. He was created as the Image. He was set in the garden of Eden to till it and to keep it. That is the usual English translation 42, but the writer of Genesis chose his words carefully and did not in fact describe Adam as a gardener. Jewish interpreters in the time of Jesus did not think of Adam as a gardener. The Hebrew word translated ‘to till’ also means ‘to serve a liturgy’, and the Hebrew word translated ‘to keep’ means to preserve the teachings. The role of high-priestly role of Adam and of every human being was to lead the worship of creation and to preserve right teachings about how we should live in the world. …Nobody knows for certain the origin of this Slavonic text, the Book of the Secrets of Enoch. The oldest known copy was made in the 14th century AD. It could have been translated from much older materials, or it could have been composed at any time before that. Either way, it shows how Psalm 110 (109) was understood by someone at that time in old Russia. Enoch entered heaven and stood before the throne. There the LORD commanded the archangel Michael to remove Enoch’s earthly clothing, to anoint him with perfumed oil, and to vest him in the clothes of the LORD’s glory. In temple reality, this was the garment of fine white linen worn in the holy of holies. This was the equivalent of Jesus’s shining white garment that the disciples saw at the Transfiguration. Enoch described the oil as like sweet dew, perfumed with myrrh.52 This was the temple oil, the dew of Psalm 110 (109). Then, said Enoch, ‘I looked at myself and I had become like one of his glorious ones’. Enoch had become an angel. He was an angel high priest, wearing the robes of divine glory. “OUR GREAT HIGH PRIEST: THE CHURCH AS THE NEW TEMPLE” by Margaret Barker. Fr Alexander Schmemann Memorial Lecture. St Vladimir’s Orthodox Seminary, New York, 28 January 2012. Irenaeus concluded—amazingly—that Adam came into being as a result of Christ and his passion, that Adam was made in the image of the incarnate Christ, who himself is the beginning and the end. Adam as the sinner is the antitype of Christ as the glorious; indeed, the Jewish tradition that saw Adam as a priest, a patriarch, and a king, was utterly transformed in early Christian thinking, which saw Adam as failing in all these vocations and Christ as fulfilling them. The glory of Adam became the glory of Christ. The modern word “typology”—expressing this relationship and so many of the characters and features of the OT with those of the NT—hardly does justice to the transformative thrust of Christian thinking. “Typology” must be understood against the backdrop of this reconfiguration of history, which, then, began not in some calendrically datable time five thousand, six thousand, or even 13.7 billion years ago, but with Christ and his incarnation and, even more, with his passion. Indeed, to the extent we dwell with the fathers in this perspective, the significance of the age of the world is entirely limited to the sphere of science and bears no theological significance whatsoever. Christianity often appears, however, to preach that if men will try hard enough to live Christian lives, the crucifixion can somehow be reversed. This is because Christianity has forgotten itself, forgotten that always it must first of all stand a the cross. …In this world Christ is crucified, His body broken, and His blood shed. And we must go out of this world, we must ascend to heaven in Christ in order to become partakers of the world to come. …He became man and lived in this world. He ate and drank, and this means that the world of which he partook, the very food of our world became His body, His life. But His life was totally, absolutely eucharistic–all of it was transformed into communion with God and all of it ascended into heaven. And now he shares this glorified life with us. …The Eucharist is the sacrament of unity and the moment of truth: here we see the world in Christ, as it really is, and not from our particular and therefore limited and partial points of view. Intercession begins here, in the glory of the messianic banquet, and this is the only true beginning for the Church’s mission. It is when, “having put aside all earthly care,” we seem to have left this world, that we, in fact, recover it in all its reality. …Adam is again introduced into Paradise, taken out of nothingness and crowned king of creation. Everything is free, nothing is due and yet all is given. …And God has made us competent, as Paul Claudel has said, competent to be His witnesses, to fulfill what He has done and is ever doing. From chapter two in For the Life of the World by Alexander Schmemann (23, 42-46). It seems natural for man to experience the world as opaque, and not shot through with the presence of God. It seems natural not to live a life of thanksgiving for God’s gift of a world. …The natural dependence of man upon the world was intended to be transformed constantly into communion with God in whom is all life. Man was to be the priest of a eucharist, offering the world to God, and in this offering he was to receive the gift of life. But in the fallen world man does not have the priestly power to do this. His dependence on the world becomes a closed circuit, and his love is deviated from its true direction. He still loves, he is still hungry. He knows he is dependent on that which is beyond him. But his love and his dependence refer only to the world in itself. He does not know that breathing can be communion with God. He does not realize that to eat can be to receive life from God in more than its physical sense. …The world is meaningful only when it is the “sacrament” of God’s presence. …For one who thinks food in itself is the source of life, eating is communion with the dying world, it is communion with death. Food itself is dead, it is life that has died and it must be kept in refrigerators like a corpse. For the wages of sin is death” The life man chose was only the appearance of life. God showed him that he himself had decided to eat bread in a way that would simply return him to the ground from which both he and the bread had been taken…. [Man] ceased to be the priest of the world and became its slave. From chapter one in For the Life of the World by Alexander Schmemann (16-17). Man is a hungry being. But he is hungry for God. Behind all the hunger of our life is God. All desire is finally a desire for Him. To be sure, man is not the only hungry being. All that exists lives by “eating.” The whole creation depends on food. But the unique position of man in the universe is that he alone is to bless God for the food and the life he receives from Him. He alone is to respond to God’s blessing with his blessing. The significant fact about the life in the Garden is that man is to name things. As soon as animals have been created to keep Adam company, God brings them to Adam to see what he will call them. “And whatsoever Adam called every living creature, that was the name thereof.” Now, in the Bible a name is infinitely more than a means to distinguish one thing from another. It reveals the very essence of a thing, or rather its essence as God’s gift. To name a thing is to manifest the meaning and value God gave it, to know it as coming from God and to know its place and function within the cosmos created by God. To name a thing, in other words, is to bless God for it and in it. And in the Bible to bless God is not a “religious” or a “cultic” act, but the very way of life. God blessed the world, blessed man, blessed the seventh day (that is, time), and this means that He filled all that exists with His love and goodness, made all things “very good.” So the only natural (and not “supernatural”) reaction of man, to whom God gave this blessed and sanctified world, is to bless God in return, to thank Him, to see the world as God sees it and–in this act of gratitude and adoration–to know, name and possess the world. All rational, spiritual and other qualities of man, distinguishing him from other creatures, have their focus and ultimate fulfillment in this capacity to bless God, to know, so to speak, the meaning of the thirst and hunger that constitutes his life. “Homo sapiens” [“man the wise”], “homo faber” [“man the creator”] yes, but, first of all, “homo adorans.” The first, the basic definition of man is that he is the priest. He stands in the center of the world and unifies it in his act of blessing God, of both receiving the world from God and offering it to God–and by filling the world with this eucharist, he transforms his life, the one that he receives from the world, into life in God, into communion with Him. The world was created as the “matter,” the material of one all-embracing eucharist, and man was created as the priest of this cosmic sacrament. So doth the potter sitting at his work, turning the wheel about with his feet, who is always carefully set to his work, and maketh all his work by number. He fashioneth the clay with his arm, and boweth down his strength before his feet (Eccles. 38:32-33). This care, this skill, this freedom of the human artist before his work, perfectly evokes the attitude of the Divine Artist vis-à-vis His creature. All men are from the ground, and out of earth, from whence Adam was created. As the potter’s clay is in his hand, to fashion and order it all: all his ways are according to his ordering: so man is in the hand of him that made him, and he will render to him according to his judgment (ibid, 33:10, 13-14). When the soft, stone-free roll is placed on the small wheel, Yamun spring lightly to his place. He murmurs the humble prayer sanctifying every need—In the name of God!—and the mystery begins. It is the beginning of the world…. Yamun imparts a circular movement to the apparatus, the movement of the stars, the principle of all genesis…. A earthen flower rises, rises and opens, although he scarcely seems to touch it. He follows its ascension, caresses it, and restrains it with awe. Like a god, Yamun concentrates on his work, and suddenly it is finished. With a single stroke of the wire, he detaches it from the socle. An offering! With careful hands, he holds it up. Is it real? It has risen so quickly from the original ground, that we might believe that simply dreaming it was enough to make it. 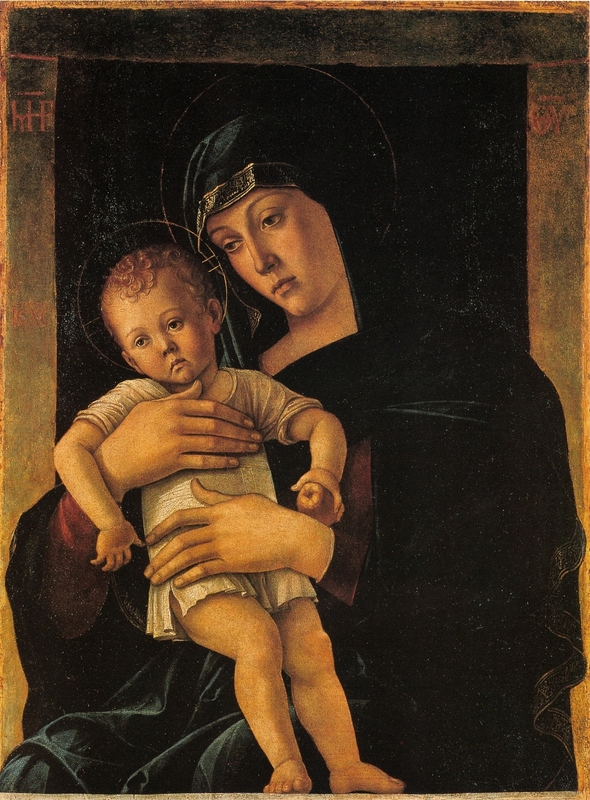 Giovanni Bellini, Madonna Greca, 1460-64. Tempera on wood (32.3 x 24.4 inches), located in the Pinacoteca di Brera, Milan. In Bellini’s Madonna Greca, both mother and son gaze sadly off-stage while he holds an apple, propped against her wrist. The apple brings to mind a scriptural allusion. He is, in the words of Elizabeth, the fruit of her womb. But the fruit also connotes the fateful fruit of the garden of Eden: the fruit of free will, offering humans the choice between obedience and rebellion. Mary is the new Eve, also given a choice. Mary, accepting her role as theotokis or God-bearer, is given the opportunity to offer the fruit to the new Adam who upends the fall, turning things right side up again. And Jesus doesn’t play a passive role either. He holds the fruit and the possibility of choosing a different path. Mary and Jesus both are making choices of cosmic significance. From “On Death in December” by Susan Bruxvoort Lipscomb in the 2011 Advent/Christmas issue of The Cresset (vol. LXXV, no. 2), page 9.